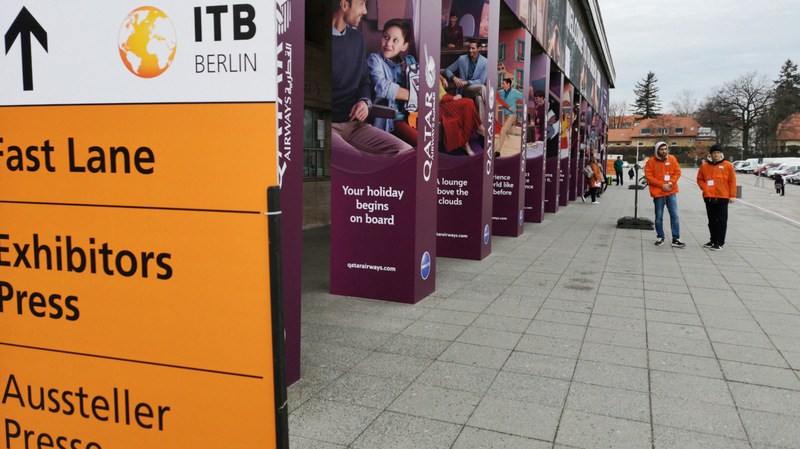 Its our final day at ITB Berlin and what an experience it has been so far. From an enchanting Opening Ceremony hosted by Malaysia, networking events, informative seminars, meeting hundreds of people and exploring hundreds of countries in a single destination, it has been very successful. Of course we met with people who are just planning a holiday and exploring their options and even if they decide St Helena is their preferred destination it will be a while before we see their feet over the threshold at St Helena. 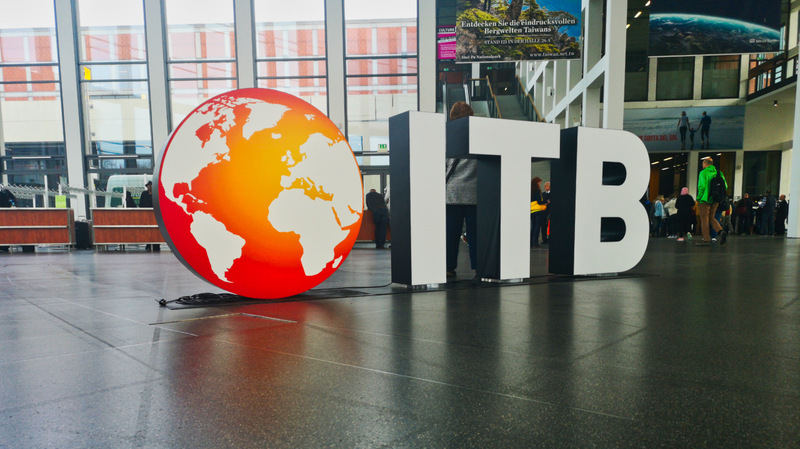 Ultimately however, this experience at ITB is increasing the St Helena footprint, its presence in the tourism industry and providing the collection of data which is necessary as we build a successful tourism industry. Good morning from a wet and cold Berlin today (Saturday). Well, cold by St Helena standards, with temperatures at 9 degrees this morning. It has been an interesting day so far. It has been the first consumer day and the St Helena stand has been inundated with potential visitors. In the first half of the morning we have seen several hundred people visiting us. Of course we use the word potential as a lot of them are visiting purely as a matter of interest, but the good news is that many are coming. We met several people this morning who have now booked tickets to St Helena via the Airlink flight and many have taken details and asked for itineraries to be compiled in anticipation of them visiting soon. 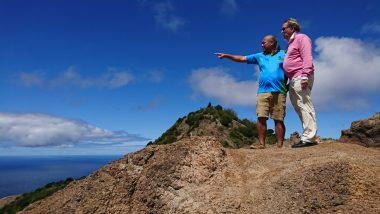 Some of our visitors are booked to visit St Helena on Cruise Ships over the next year and were very interested to hear first hand all about St Helena and as part of a promotion, Island Images are giving them a free Island Tour for those cruise visitors who are visiting between today and tomorrow. 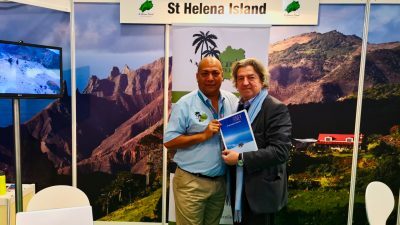 We also met with Peter Metz, a contributor to St Helena Travel who had promised to drop by the stand. In all today has been very busy. 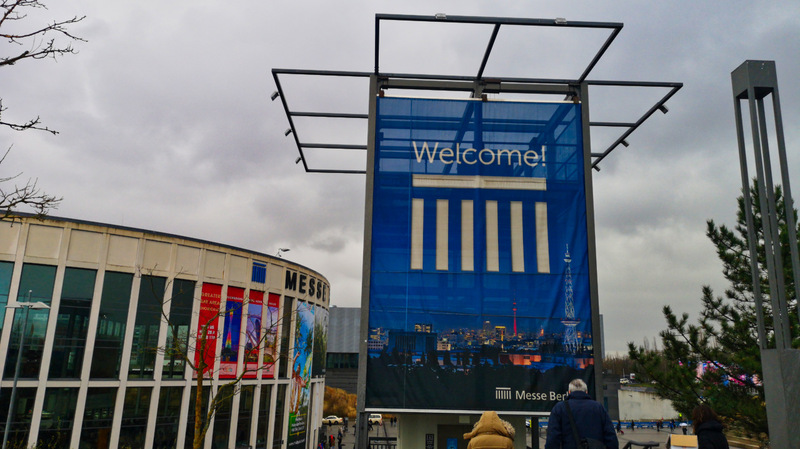 Day 3 at the ITB in Berlin is the final day of Business to Business activities. The morning start of a 45 minute commute via an ITB Shuttle Bus give the opportunity to see various part of Berlin en-route which is an added bonus. Today is also a Public Holiday in Germany so there was a lot less traffic to negotiate on our way. Just an hour in, we have had some 30 visitors to our stand and Juliet has been interviewed by Breaking Travel News from London England about St Helena, the additional flights, tourist numbers and various local accommodations. Tomorrow and Sunday will be public days at the travel fair. An early start for Team St Helena at the ITB this morning. Another busy day is expected with some scheduled meetings to take place and the team has also lined up visits to some of the other business stands. There are a number of other small islands still new to the tourism industry and are trying to build a tourism business, said Derek, and there is a lot that we can learn from how they do it and also share information. It is very interesting being at the event so early, seeing the businesses starting to build up. It is also strange to be among some of the leaders in the industry, with Cuba, Mexico, Guatemala and Barbados surrounding the St Helena stand. 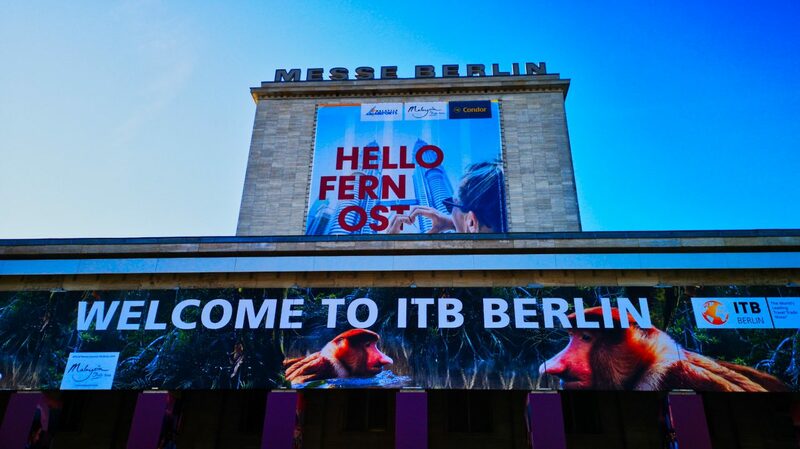 ITB…. Come and visit. Hall 22b Stand 212. One of the first visitors to the St Helena stand at ITB Berlin today (Wednesday) was Robrecht Willaert from Travel Magazine. 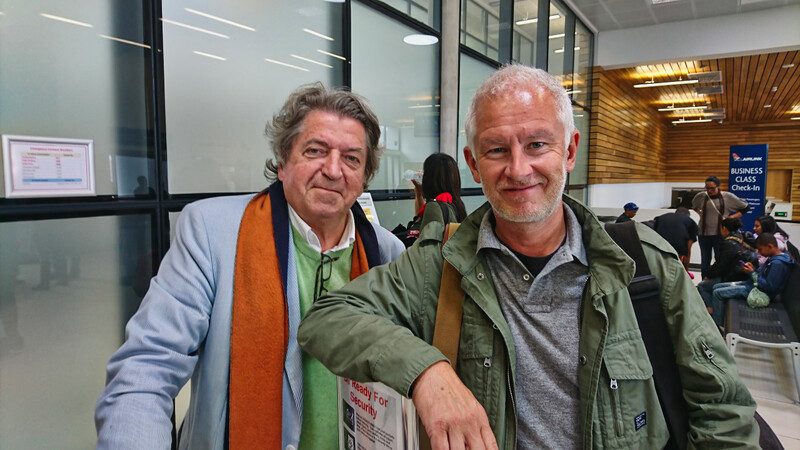 Robrecht first met Derek from Island Images in 2018, when he and fellow professional Gerritt Op de Beck when they visited the Island to write a 16 page story on St Helena as a travel destination. Spending 2 weeks on the Island, Robrecht met with numerous locals, visited many of the Islands attractions and enjoyed much Island life. On his return to Belgium Travel Magazine compiled their second MagBook which contained St Helena as a special Tourism Destination. In catching up this morning, Robrecht said this was his 41st consecutive year that he has attended the ITB and presented Derek with a signed copy of the MagBook. 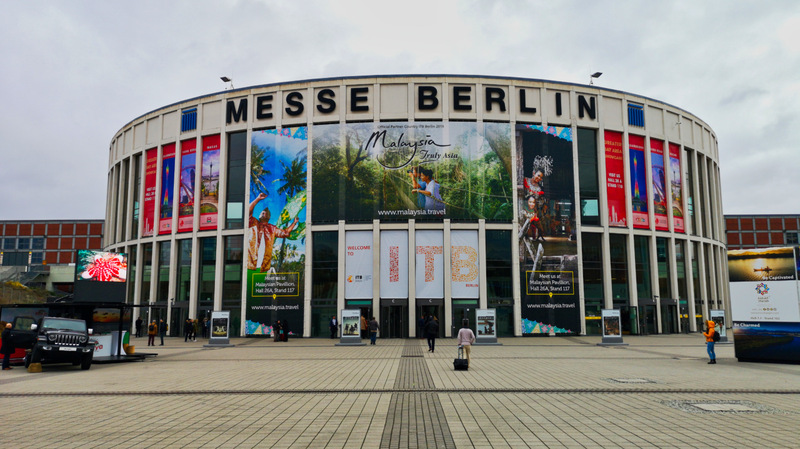 Island Images will spend the next five days at ITB Berlin, where for the first three they will be meeting with businesses and then with the public, promoting their business and St Helena. Island Images is part of a three person team attending this years event, the largest travel fair in the world and which has been running for 50 years. Juliet Williams (Tourism Manager) and Nicole Peters (Tourism Officer) are the other members of the team who travelled to Berlin via Johannesburg and Frankfurt. 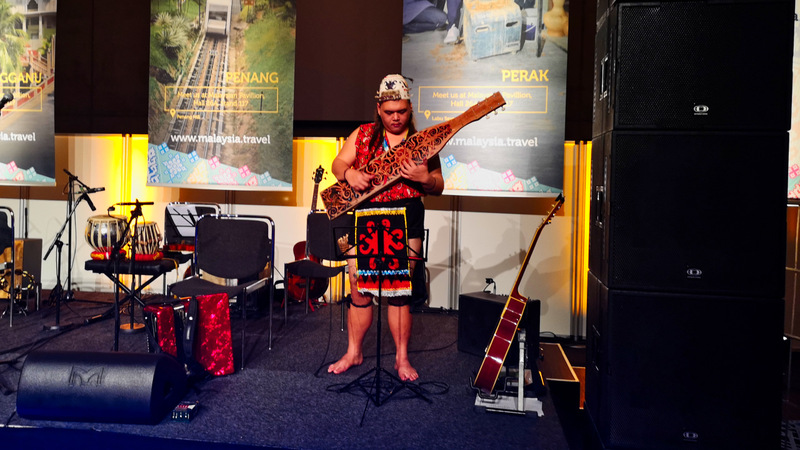 The event which bears the message “One Industry – One Market – One Brand was opened last night (Tuesday) in front of 3000 attendees hosted by the main sponsor and partner for this year’s event – Malaysia. The St Helena Team which left the Island last Saturday has spent the past few days setting up their stand and taking in some of the sights, sounds and the culture of Berlin. Juliet Williams had previously attended last years ITB and for Nicole it is her first ever event. Derek from Island Images on the other hand attended WTM in London in 2017 and has promoted Island Images and St Helena himself several times in 2018 through meets with tour operators and agencies in Africa. With thousands of exhibitors and even more attendees its is going to be a busy few days! Leaving St Helena this past weekend was Robrecht Willaert and Gerrit Op de Beeck from Travel Magazine in Belgium. 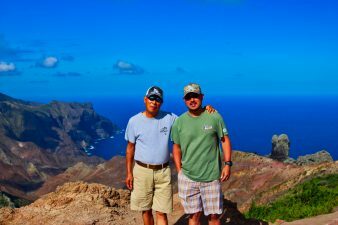 The pair, working on a 16 page article about St Helena had spent a week with island Images, discovering the Island, interviewing locals and officials and enjoying what St Helena has to offer. The article about St Helena will be covered in a special French and Dutch Magbook about future destinations, which has a circulation of about 7000 print copies and an online platform. Travel Magazine and what we do, said Robrecht, the Editor in Chief, is not a consumer magazine, it cannot be bought off the shelves, this is a technical publication which feeds into all tour operators in Europe and around the world and is used by them to then promote the destinations to their clients. 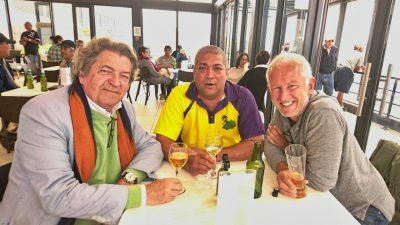 Gerrit, the Travel Journalist and Photographer said St Helena is a unique destination. He has been in this field for more than 25 years and travels all over the world, accounting for almost half of the year in world miles. Such is the life of these gentlemen, they arrived in Antwerp on Tuesday morning and left Tuesday evening for another destination. One thing is certain, we will see them again sometime soon! Visiting the Island recently were the Jung family from the United States. The pairs main reason for visiting was for fishing and this they did of the shore using only lures. A boat excursion also took place which they thoroughly enjoyed. Other days were spent hiking to some of the Islands most beautiful locations. The visit was awesome said son Robin and definitely we would like to come again. We now understand that bookings have been made for early next year. It was great having you guys and we look forward to welcoming you again soon! 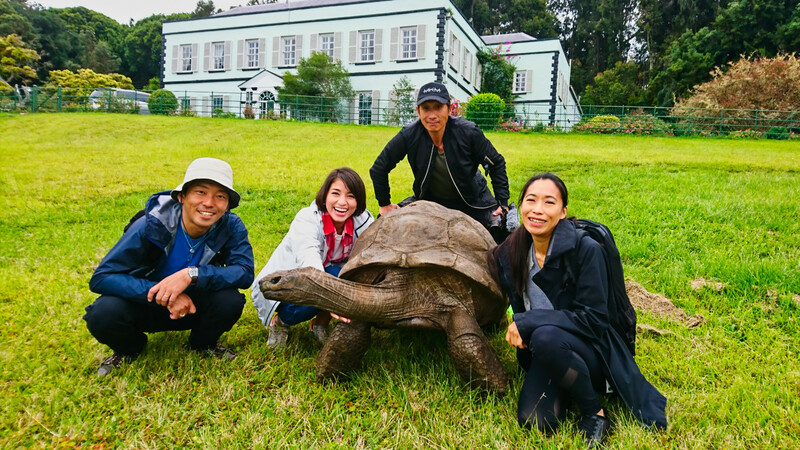 Island Images recently bid farewell to a Japanese film team comprising five members who were on Island filming “Following in the Footsteps of Napoleon”. Initially the team were due to be on Island for a week, but a delay enabled them an extra week, allowing them to do a few touristy things and importantly adding to the content they had already for their programme. The programme a long running documentary series in Japan is set to be shown in Japan next month September, so it has been a few hectic weeks since their return to have it all edited and ready for showing. Barbie Hita the TV presenter was accompanied by her Director Akihiro, cameraman Tateoka, assistant Morimoto and Production Manager Hannah Kuyama. The group loved the Island and at least one of them a planning a return (holiday) trip. Island Images has recently became a Qualified Tour Operator affiliated to the South African Tourism Services Association (SATSA). The Company training was undertaken by Derek Richards during the early months of this year via an online portal and was completed in June with outstanding results. 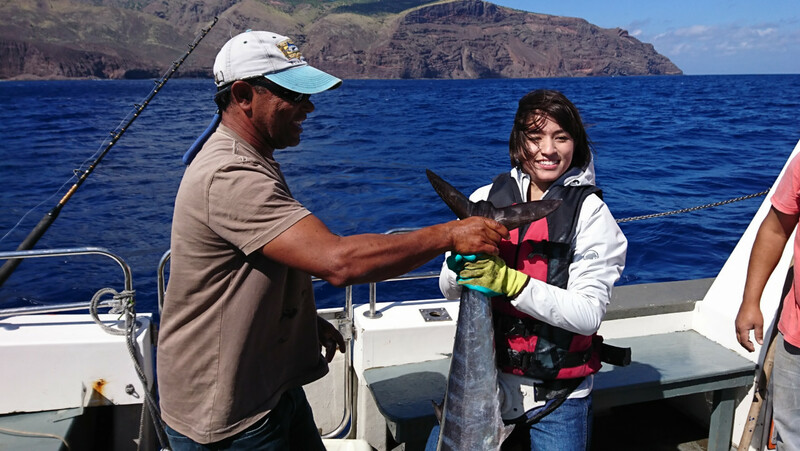 Derek considers this investment essential in his business which comes at a very important time in St Helena’s Tourism Industry. tours to a discriminating travel public. This has been a very comprehensive course Derek added and the next step will be to add the practical element.